Hello everyone. This is Nichol Spohr and I’m so excited to be sharing a set of three Christmas cards featuring dies from the 2018 Holiday Die D-Lites Collection. 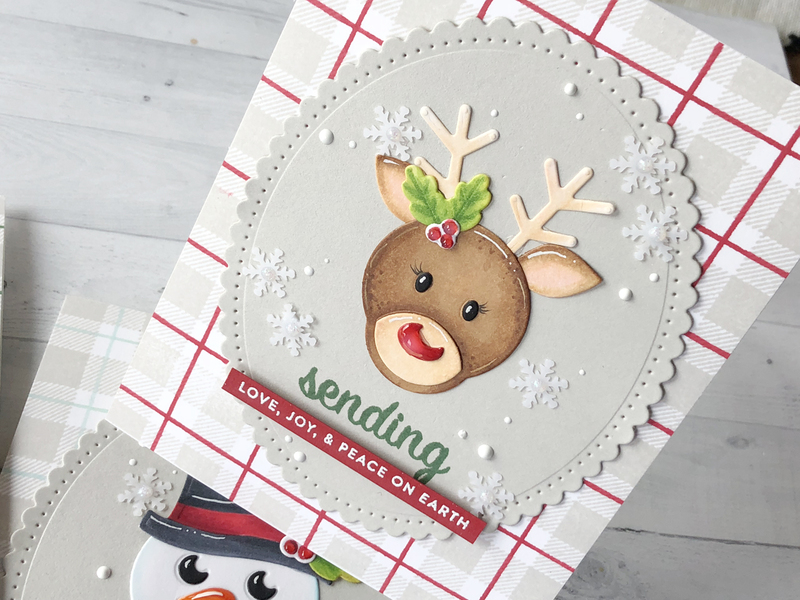 I die cut the Die D-Lites Reindeer, Santa, and Snowman Dies from smooth white cardstock and colored in the pieces with Copic Markers before assembling and adhering to a Fancy Edged Oval. 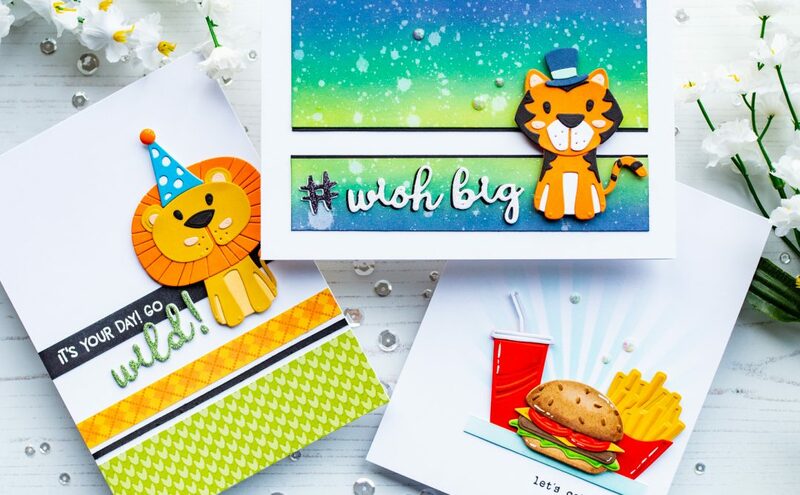 The Copic coloring gives these die cuts so much depth and dimension and is a great way to customize your die cuts! 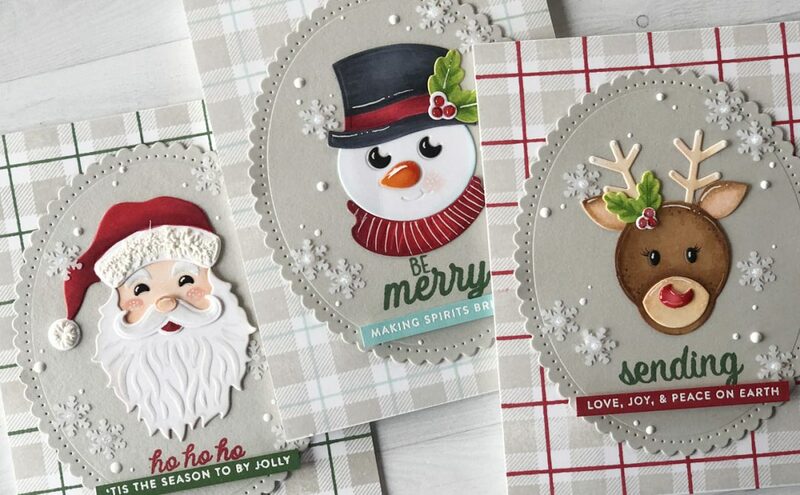 The backgrounds for all three cards were created by stamping a plaid background builder stamp on smooth white cardstock with light gray ink and either red, green, or aqua ink. 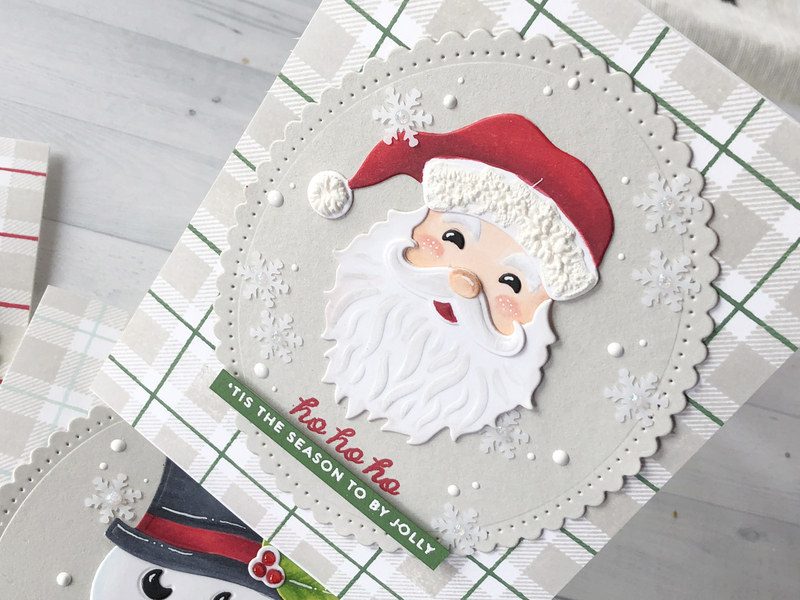 A light gray cardstock circle was die cut using a Fancy Edged Oval Die and adhered to the center of each plaid background. A scripty sentiment was stamped directly on each oval with either green or red dye ink. 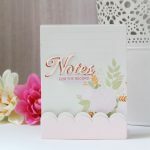 An additional sentiment phrase was stamped on cardstock using clear embossing ink and heat set with white embossing powder before being trimmed into a thin strip and adhered under the script stamped greeting with foam adhesive. 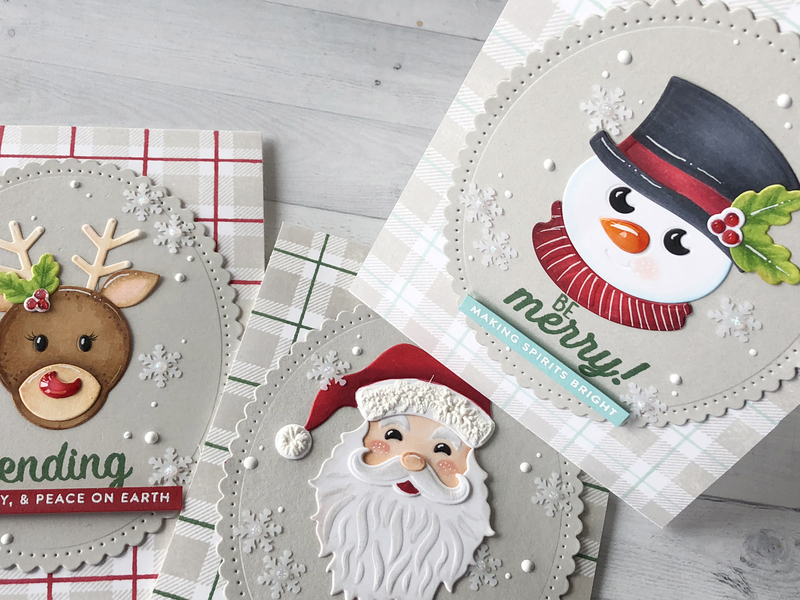 The Die D-Lites Reindeer, Santa, and Snowman Dies were die cut from smooth white cardstock and colored in with Copic Markers. The eyes for all three were die cut from black cardstock. 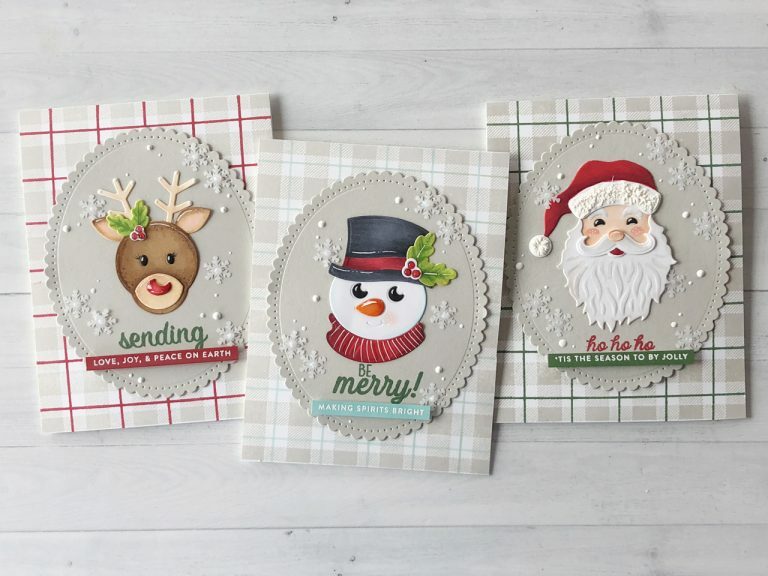 Each card was finished with a scattering of snowflake sequins and Nuvo Crystal Drops in White Blizzard and Gloss White. 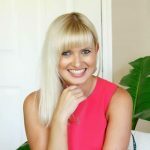 Love your cards, Nichol. I think Santa is my favorite. And, I like how you colored your pieces with Copis instead of using colored card stock. There is such great depth and detail to the images. Thanks for the inspiration. 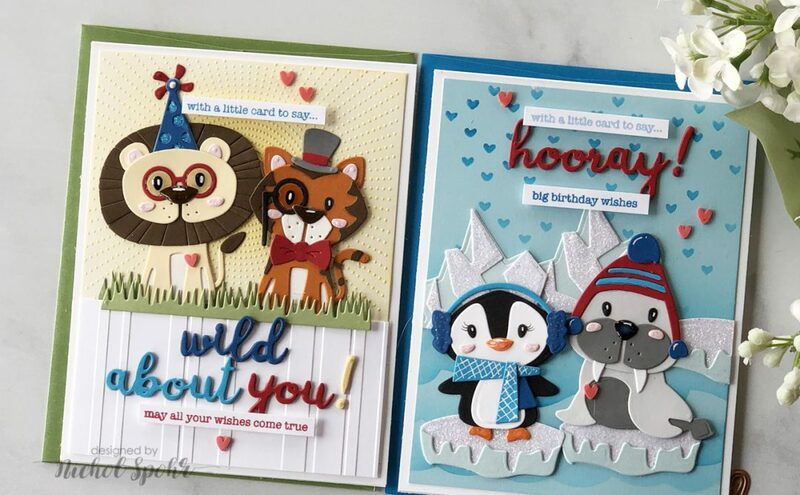 Nichol, I always love your cards but these are some of the cutest cards I have ever seen! They are just adorable! You always inspire me. TFS!!! This is the first time I have watched a Spellbinder’s video. Loved your attention to detail and the use of Copic markers. 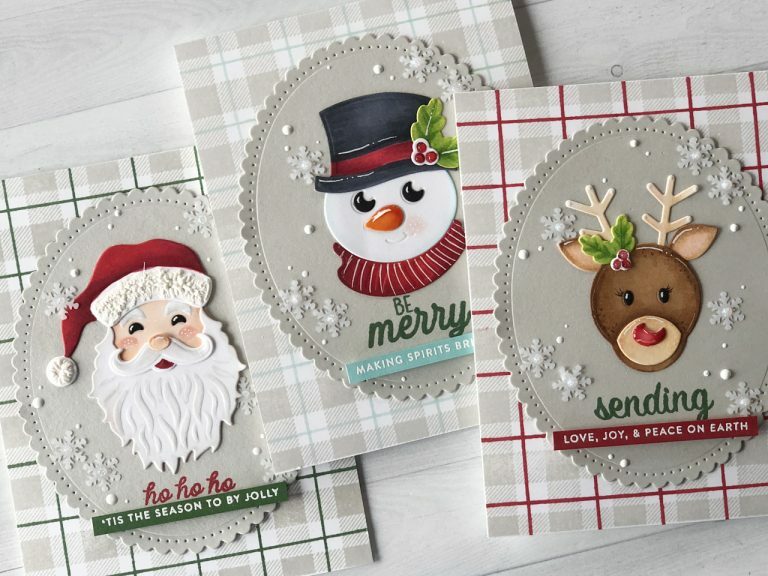 These cards are so lovely! 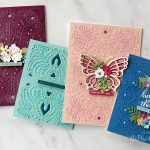 Very pretty cards, I love them all. Thank you for sharing. 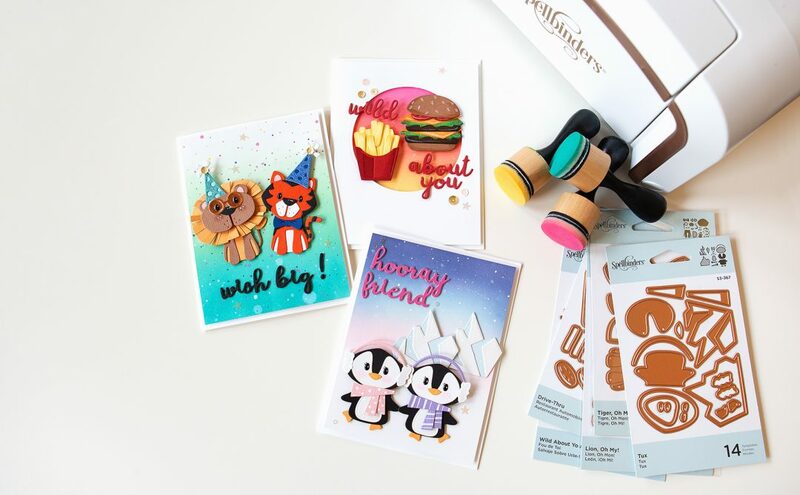 what did you use to stamp the backgrounds of the cards and the colors you used? what did you use for the sayings and words? what did you use to make the snow? Mary, Nichol used Marvy Snow Marker. 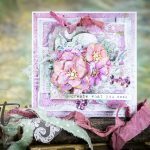 Be sure to check the “Other Supplies” section at the end of the post where Nichol listed all other supplies she used to make these cards.